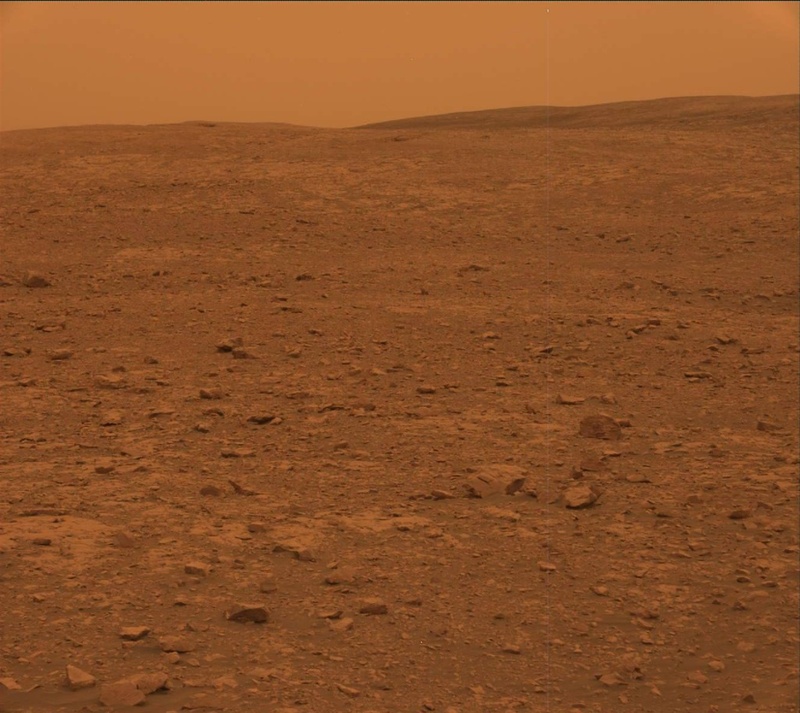 The image above shows the Mastcam view as of Sol 2104, in which the nearby terrain is clearly visible, but nothing beyond the foreground, and the entire scene looks a murky red-brown color due to the dust storm. Unhampered by the storm, Curiosity is heading back toward a site visited on Sol 2005 for what we hope will be the next drill target. Jupiter is known for its "Great Red Spot", which is a swirling storm thousands of kilometers in diameter. The rover drive destination could perhaps be called the "Great Red Spot on Mars" as it seems to indicate the presence of a reddish mineral, hematite, as seen from orbit and in rover spectra. Of course this spot is not at all as prominent from orbit as Jupiter's Great Red Spot, but the orbital spectra do predict this location to have one of the highest surface hematite abundances in this part of Gale crater. ChemCam was marked healthy over the weekend after repetition of a known event last week. REMS lost a small amount of science data over the weekend in a slight anomaly, but the instrument remains healthy. Today we will uplink a one-sol plan. Activities will include a drive to cover most of the 50 meters remaining to our planned drill target. There are three targets in the pre-drive workspace. The arm will deploy MAHLI and APXS to target "Chippewa". APXS will get two 15-minute integrations; MAHLI will image from 25 and 5 cm distances. ChemCam will target "Animikie" nearby. Mastcam will document that target plus "Barnum", a piece of bedrock in between the other two. Navcam will continue checking the atmospheric opacity and Mastcam will collect a 4-image mosaic of "Taconite_crater." DAN, REMS, and RAD will continue taking environmental data. Tomorrow is a "soliday" or effectively a leap day in which Earth has an extra day relative to Mars. Our next sol of uplink will be on Wednesday.